Jodie Cooper shares a very unique and honest blog post today as my guest blogger. Her story is very familiar and I see people jump from company to company often, hoping the success that seems to elude them will magically appear with the next direct sales company they join. The problem with that idea, as Jodie so beautifully shares, is that the one component you consistently bring to every opportnity is YOU. 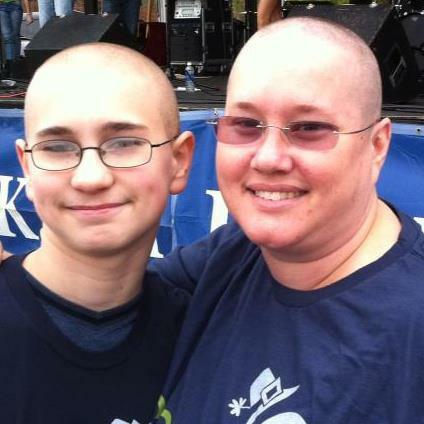 In March of 2013, my son and I made a commitment to St. Baldrick’s Foundation to raise funds and shave our heads bald to benefit childhood cancer research. With the loss of my hair, I had an epiphany. I am stronger and more capable of accomplishing things than I ever thought possible. Facing the public, co-workers and my family with no hair was challenging, but armed with a smile and a warm hat I found the strength I needed, buried inside of me. Realizing that my hair would return rather quickly compared to those facing the challenge of fighting cancer my outlook began to change. My upline didn’t train me – Did I reach out for help? Did she know where I was struggling? How is she supposed to know what areas I need help if I don’t ask? My area is over saturated with consultants for me to be able to find anyone to host a party – How much time and effort was put into booking? Did I call anyone to try to book parties? Was I actively looking for sponsors at my parties? The company closed abruptly – Did I do everything I could to help them succeed? Were my parties as successful as they could have been? I will build a successful team. I will work to make our company strong and successful. I will never forget the lessons learned along the way. I will actively participating in training. I will coach my party hosts. I will sponsor team members. I will hold successful blending bar parties. I will stumble along the way but I will get back up and keep moving forward. It took losing my hair to realize how important I am to the success of my business. Being present in my business is essential! Only I can choose each and every day to be committed and put forth the effort. After all, if I don’t, who will?